On the Wedding Day, a few tips will go a long way to make it go by without any problems! In my years of experience I have collected amazing tidbits that have helped all my brides have a great day. With having been to over 300 weddings, I can share what works and what doesn't. First, you want to make sure you have enough space for getting ready. There is nothing worse then being in a small cramped getting ready room with 6 people, a hair person, a makeup person and a photographer. Your photos will shine if you have the room to allow for some movement in the room. While it might cost a little bit more money, in the long run, you won't feel so stressed with everyone on top of you. On the other hand, if you love tons of people and the excitement of lots of hustle and bustle, the more the merrier! Its personal preference. Listen to yourself first before anyone else. You will end up having a LOT of suggestions on what you should and shouldn't do on your wedding day. What you want is the most important. From Getting Ready to the End of the night. When getting ready, you want to make sure you only have the people in the room you really need there. If you have too many people it can be overwhelming, and cause stress. The fewer people, the better. One tip for getting ready is to have all your bridesmaids ready before the bride is done getting ready. You want them all in their dresses and ready to go to help the bride. 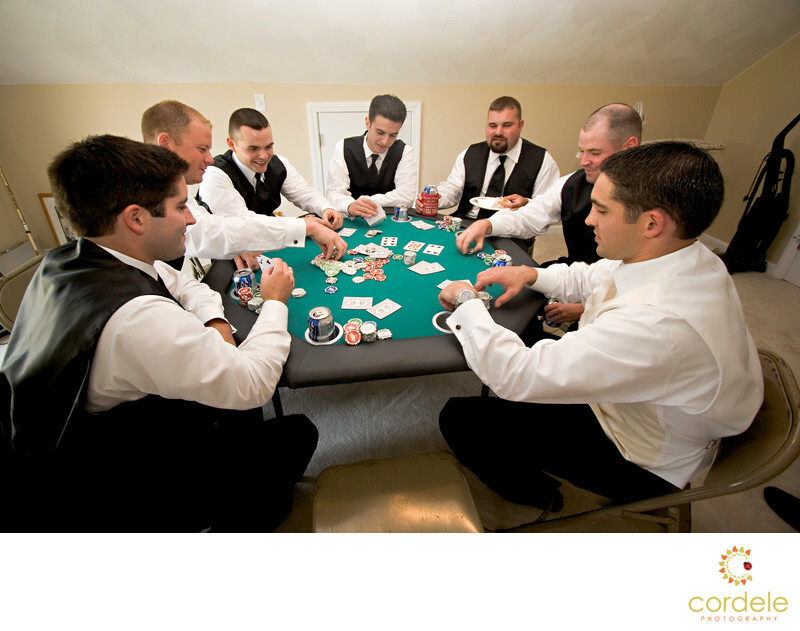 Having everyone ready to go will make sure the focus stays on the bride and all unforeseen issues with the bridal party are dealt with before hand. What pictures should I take? Everyone has seen those long lists provided by the magazines telling you to take a photo of the cake, and of the dress and off the shoes. I often joke, if I am not doing those things, what on earth am I doing!? What a photographer really needs is a list of your family photos. We don't know who is married to whom and if you have 3 or 4 brothers. We need a list of the family combinations to be sure we don't miss any. You want to be sure to capture the couple with each of their parents, as well as all siblings You also want to make sure you look over your guest list for the relatives that don't make it in many family photos. These weddings are a way to make sure family is captured together. You can spend all day taking different combinations, so just focus on the core family. Maybe a photo of the brides parents with their parents. Also, don't forget the grandchildren photo! How much time do I need for photos with family? Realistically, not much. The photo of your family takes less than one second to actually take, what takes up time is organizing and finding the people in the photo. You want to make sure everyone knows where and when to be for photos. Often after the wedding, the bridal party disappears to go get food and a drink. They always tend to forget they will have food and drink available to them exclusively at the photo site. I have spent many weddings waiting for a bridal party member to return because they needed something they didn't have. If you can tell everyone just wait, the photos won't take long if everyone is where they need to be. How many hours do I really need for wedding photography? Typically most packages run 6-8-10 hours. A lot of factors come into play when deciding what you want for coverage. How many locations will you be going to? How many people are in the wedding? Is the ceremony location and the reception location in the same spot? Travel time is included in the coverage, meaning, the coverage is continuous. Typically if you are getting reading in one location, ceremony in another and then reception at a third location, you will want 8 hours of coverage. If you are having location and ceremony and getting ready all at one location, you can get by with 6 hours of coverage. I'll never sell you more coverage then you need. For a 6 hour wedding with under 100 guests, I normally suggest you get 1 photographer. If you are over 150 guests with multiple locations, have two photographers can help make sure the event is covered from all angles. Do I need to have photos of the guys getting ready? Honestly, I always tell people its up to you. The guys getting ready normally consists of the TV on, beer out and the guys putting a shirt on. It sounds like a stereotype, but 90% of the weddings I do, that's what I walk into. Rarely do I have any award winning guys getting ready photo. The best getting ready photo of the guys was this one. Where should we take the photos if it rains? Well, this one falls back on the client a little. I can give you a few suggestions where I might put you, but on the day of, the light might be different. I look for light first then background. The background is not as important as having good light. Can you come look at our reception location before hand?